The secret epistemology of paleontological fieldwork. What is this thing? Actually, we don’t know yet: that’s what is exciting… Before explaining why it’s so exciting, we’ll need to think about the relationship between science and philosophy a little. An upshot of this distance is that philosophers miss the secret epistemologies in science. A secret epistemology involves decisions, procedures, and knowledge-generation practices which are (to use Steven Shapin’s term) invisible, but nonetheless crucial. Presumably, they’re not invisible to the scientists themselves. But, because they don’t make it into publications and other public expressions of scientific business, they’re easily not included in analysis of science. In paleontology, Caitlin Wylie’s work exposes and examines the secret epistemology of fossil preparators: the typically unsung artisans who split fossil from rock and thus are crucial for vertebrate paleontology. Today, I want to briefly discuss another area full of secret epistemology: fieldwork. At first blush, it is surprising to suggest that fieldwork in paleontology is secret: surely the image of the brave fossil-hunter spotting the stray bit of bone and thus stumbling upon a momentous discovery is a crucial part of our image of paleontology. Sure, sure. But what is hidden about fieldwork for philosophers is that it often involves some fascinating decision-making processes which broadly fall under what Charles Peirce called ‘the economics’ of research. That is, in fieldwork paleontologists are making decisions which finely balance the ‘properly’ epistemological with the pragmatics of extraction: time, money, person-power and so forth. Such decisions are both revelatory of the aims and values of scientists, they make a crucial difference to the shape of scientific research, and (as Peirce’s term suggests) they have a certain rationality to them. They are, in short, tasty and abundant philosophical fodder. And fodder which is pretty untouched (with Marcel Boumans’ Science outside the laboratory and a chapter in Bob Chapman and Alison Wylie’s Evidential Reasoning in Archaeology being exceptions which, I think, prove my point). In what follows, I’ll do some scene-setting which will return us to the mysterious fossil above, I’ll then distinguish between two kinds of paleontological fieldwork, before emphasizing the importance of locality - of place - in such work. 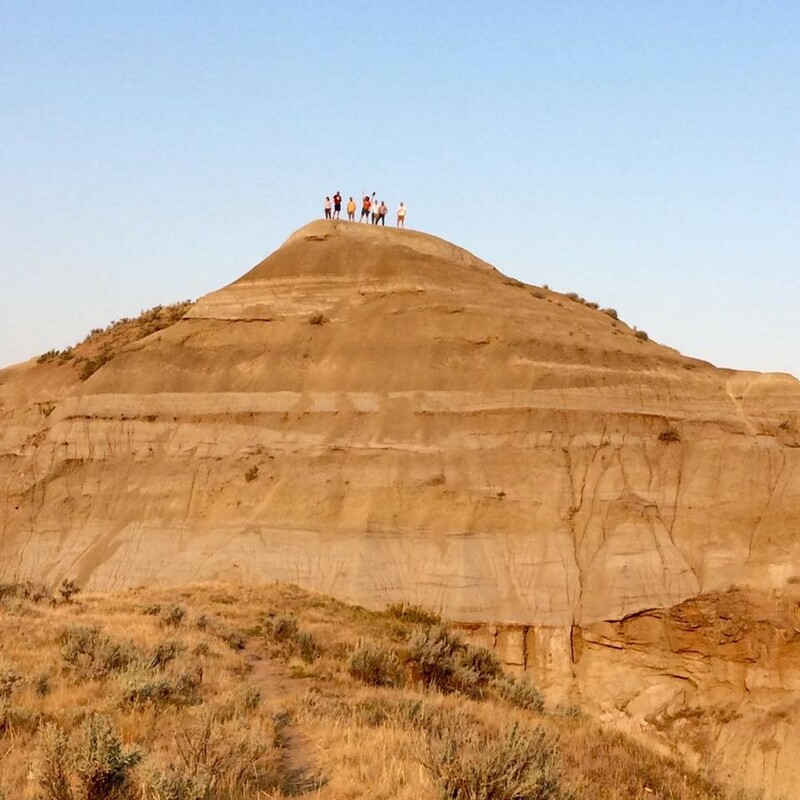 Recently, a bunch of us philosophers, social-scientists and historians of paleontology went off to Dinosaur Provincial Park in Alberta to run a workshop. Now, if you don’t know about Dinosaur Park, it’s a world-heritage-listed, dinosaur-fossil-filled, stretch of gorgeously stark Badlands. It's a seriously alien landscape. You can camp there, and hike and stuff. You should definitely go. When you do, I recommend going on the Centrosaurus bonebed hike. While we were there, Don Brinkman, the director of the Tyrrell Museum, was incredibly generous with his time and took us on a tour of some sites in the park (oh the perks of being a dinosaur-philosopher! ), much of which were Cretaceous wonderlands (at times it felt like we had to work hard to not find fossils – but I’ll not list all of them, at least not in this post…). If you want to get a sense of the importance of the place for paleontology, check out Don’s excellent guest post from last year. Here are some highlights from the tour, which I’ll link with secret epistemology below. Much of the tour had a kind of ‘show and tell’ feel: we would find a fossil, excitedly bring it to the paleontologists in the group, who would happily but matter-of-factly identify them as some ceratopsid frill, or an albertosaur tooth, or crocodile skin, or some such. These fossils were very nice perhaps, but not interesting or exciting for the expert (to be explicit: these were definitely interesting and exciting for us!). The paleontologists, it became abundantly clear, were keyed into an epistemic program that we weren’t – I’ll say something more about this below. There’s a long-toothed distinction in philosophy of science between two kinds of experiments: exploratory and hypothesis-testing (Laura Franklin-Hall has an excellent discussion). Sometimes scientists examine an experimental system with a specific hypothesis in mind. I have some theory pertaining to the experimental system, and I set it up just right to probe whether that theory is true. But sometimes they don’t have a particular theory or hypothesis in mind, rather, they just examine the experimental system to see what it will do. Often this latter activity is towards generating some pattern or phenomenon which can then become an object of study itself. Franklin-Hall, for instance, emphasizes the importance of high-throughput data generation techniques such as gene sequencing (although experiments needn’t be like this to be exploratory…). Reflecting on my experience in Dinosaur Park, it strikes me that there is a similar distinction to be had in fieldwork, and one which suggests that the difference between exploration and hypothesis-testing isn’t as big as it might appear. Until my trip, if you’d asked me to describe field-work, I would have talked about something very methodical. And indeed, some of the work in Dinosaur Provincial Park has this character. Here’s Don Brinkman (from the aforementioned blog post) describing some work Phil Currie did on the Centrosaur Bonebeds. Although there wasn’t a specific hypothesis in mind, there was a direct investigative goal: it had been noted that Ceratopsian bone beds appeared to have a different character than others in the park, and so a systematic, targeted extraction process was introduced. I think that the term ‘targeted’ is suitable: let’s call this targeted field work. Some targeted field-work is specifically to test hypotheses. Back in the 1980s for instance Peter Ward went and looked at ammonite diversity approaching the K-Pg boundary as a way of testing whether it was collapsing prior to the famous extinction event which the boundary marks. He was interested in testing whether certain big rocks hitting the earth triggered the extinction, or whether it was a mere coup de grâce (Carol Cleland discusses this work, and it gets a mention in my book which is, oh gee, so close to coming out now!). But, as with the case Brinkman describes, hypothesis testing isn’t necessary to be targeted: targeted field work is such because it involves a pre-decided, specific plan and procedure to procure particular information about some site pertaining to some question. But the kind of thinking – the secret epistemology – at which we got a sneak-peak in the field was not targeted. Rather it was, let’s call it, prospective. Here, paleontologists do not necessarily have a specific question in mind, rather they’re looking to see what is there. They walk the Badlands; follow rivers; look out for strange geological patterns. They prospect. But prospecting isn’t a random search. Rather, the search, and what is taken to be a find, are guided by two things. First, empirical expectations. These are ideas about what levels of strata are likely to yield fossils, which visual cues might distinguish fossil from rock, and so forth. I would be the first to admit that I am simply useless at finding or identifying fossils. I just don’t have the observational skills—the trained eye—or the geological knowledge. Second, some kind of significance metric. Don and the other paleontologists had ideas about what mattered. These often seemed to track what philosophers of science have called anomalies. Paleobiological knowledge is often about patterns of abundance in the fossil record. Fossil taxa have a geographic and temporal range, as well as ranges of variation in size, morphology, and so forth. During prospective field work, paleontologists are matching the stuff they find to this knowledge, and significant finds are often identified by their clashing with those expectations. They’re often looking for the biggest, the smallest, the furthest away, the most recent, and so forth. But often (as we saw for TJ and Joyce’s brain-case) simply not being identifiable is sufficient: they’re looking for something that doesn’t fit their pre-existing knowledge. A find is significant just when it is likely to fill out that knowledge: to fill in the gaps. This is only part of a kind of triage involved in prospective field work. I’ve mentioned the epistemic significance, but decisions also turn crucially on what we might expect to happen to the fossil (is it, for instance, in immediate danger of being degraded quickly by weathering) and how costly it’ll be to get it out of the ground. I don’t think prospective field-work is closely analogous to exploratory experiment, at least as typically discussed. An exploratory experiment actually looks closer to targeted field work: scientists want to generate particular kinds of evidence pertinent to particular questions. Prospective work is exploratory against a backdrop of a rich set of knowledge which sets empirical expectations and a significance metric. This is how Don and the other paleontologists saw how the braincase might be significant, and were not (scientifically) interested in the other fossilized wonders we saw. It is, then, a theoretically sophisticated epistemic activity. Further, the idea of research being guided by anomalies is typically associated with theory-testing, not exploration. And given that what gets dug up is what ends up in the museums and the labs from which the ‘raw’ material underwriting the visible science comes from, this invisible epistemology is crucial to paleontological science. There are a lot of questions to ask about this secret epistemology. The distinction I’ve just drawn might be pretty limited, and there might be more illuminating ways of carving up the landscape of fieldwork. I’m also interested in whether similar distinctions might be at play in collections work. Many paleontological discoveries don’t actually happen in the field-work stage, but through digging through museum collections. For instance, the famous disparity of the Cambrian fauna was revealed not by Walcott’s early 20th-century extracting, but by late 20th-century work in museums. I suspect that the secret epistemology of collections work and fieldwork, in the way I’ve discussed them, are pretty similar. But I want to close with a discussion of place. Dinosaur Provincial Park is a special place. It’s ridiculously beautiful of course. But, as we’ve seen, it is also fossil-rich (particularly concerning articulated fossils from the late Cretaceous). Understanding what is there, what kinds of expectations to have of it, and what we might learn from it depends crucially on understanding the specific circumstances under which that land was formed, and which forces shape it today. Geological knowledge about local history, then, is extremely important. The Badlands were formed by floods caused by glacial lakes being ‘unplugged’ as the ice ages receded. The cretaceous layers consist in two formations: the ‘oldman’ formation and the ‘dinosaur park’ formation. These have different geological contexts and we can expect to find different things there due to different patterns of preservation. What kind of paleoenvironment formed the layers plays a crucial role in how paleontologists contextualize their finds, as well as how they prospect. As for modern conditions, these matter almost as much. I’ve mentioned the fast erosion at Dinosaur Park: this both means that repeated visits to the same spot are likely to be rewarding, and that if you do find something you’d best jump to it quickly before cruel weathering occurs. What makes for good fieldwork, then, is often local. There’s no one-size-fits-all story about best practice (although: some rules of thumb are going to be crucial, and some conventions are going to be important for communication and consistency). I, of course, only had a tiniest hint at the deep knowledge and understanding that paleontologists have of Dinosaur Park. It may be that there’s a secret epistemology for each locality. And to develop working knowledge of those secrets you need to walk, dig, prospect and get to know that land really well. With thanks to Joyce Havstad for some of the pics, to Don Brinkman and the folk at Dinosaur Provincial Park for such an amazing trip and for the intrepid philosophers, historians and sociologists who came along. Also to Kirsten Walsh for a right-up-to-the-wire look-over and make-better session regarding the post's style and ideas.